Selling a boat is every bit as important as buying a boat and a little research time and elbow grease will ultimately give the same level of satisfaction. There are four key areas involved in a selling a vessel – setting a price, deciding how to sell it, preparing for sale and the final paperwork. The best method of judging a sensible selling price for a vessel is to research the current market prices. These can be found in Boat Trader and Boats and Yachts magazines and on the many sites scattered across the internet, some of which offer value check services like boatshop24. The price should then be adjusted according to the condition of the vessel and the accessories included in the sale. There are three main options to consider when thinking about how to sell a boat – a private sale, a trade in or by selling it through a boating broker. By selling a boat through a broker, the job of the boat owner is made relatively easy, but at a price. A broker typically deals with advertising, sea or river trials, surveyor liaisons, deal negotiations and paperwork for commission of between 5 and 10 percent of the final sale price, plus VAT. Brokers are usually only involved with larger vessel sales because small boats generate too small a sale price to warrant the expenditure. It is sensible to compare brokers before choosing one, by weighing up such considerations as commission percentage and whether it specialises in similar boats. Selling the boat privately involves a lot of work and organisation but if completed effectively should leave the seller with the most money. By trading a boat in when buying a new one, the seller will result in the least amount of money but will ultimately save hassle. It is worth comparing the offers from a variety of dealers because these can vary significantly. The boat could be advertised in the local paper, on a club notice board, in specialist national magazines, on sites on the internet such as eBay and simply by putting a sale sign on the boat itself. 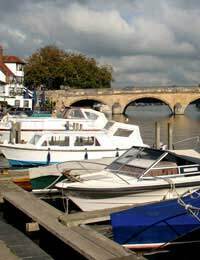 Boats sell from early spring onwards through to October, but it is best to get in as early as possible when buyers are fresh and keen. This advice applies to all boat sales including trade-ins, because the dealer will struggle to sell the boat on if the boat season is drawing to a close. When selling a boat it is worth bearing in mind that there is potentially several other boat owners looking to sell the same model, and so to sell the boat the quickest and at the best price, it pays to spend a little time and effort smartening it up. The boat needs to look like it has been looked after well during its lifetime and should also be cleaned and maintained throughout the whole of the selling period. As well the cleaning aspects such as the hull, the decks, rails, windows, carpets, curtains, bilges and engine compartment, attention should be paid to replacement and refurbishment within reason, as well as anything faulty or worn. Other aspects to consider include making sure that all machinery and equipment is in perfect working order, with particular attention to the engine. If a boat is to look like a showboat then it should be welcoming to all and appear neutral in appearance. All personal homely touches, such as accessories and decoration should therefore be removed unless they increase the value of the boat. To secure the price the boat deserves it is important to have all documents in order. Such documents include the Declaration of Conformity, which states that a boat complies with the EU Recreational Craft Directive (RCD), and the boat’s original sales invoice, that shows the VAT was accounted for. Boats manufactured before June 16th 1998 or imported outside the EU will likely not have Declaration of Conformity. It is nevertheless worth considering obtaining a CE mark because the cost is much less than the amount that might be added to the sales price for the boat. The sales invoice is important because any prospective buyer seeking to borrow money to buy the boat will likely need to see a copy of this document. Other important paperwork associated with the boat include the boat’s original operational manual together with copies of invoices detailing the engine’s service history, and any relevant licences that need to be kept up to date, such as the Boat Safety Certificate.If the same level of research, time and effort is applied in selling a boat as buying it then the greater sale proceeds that can be put towards buying an even better boat! Buying a Boat: New or Used?